At the top of its hype cycle, Artificial intelligence (AI) is transforming the energy landscape, revolutionizing how solar assets are managed, operated and maintained. The ever so expanding global capacity of solar PV paired with the growing disparity of these solar assets have made managing these assets more complex. There are substantial financial and efficiency gains to be made in using AI-driven solutions. Moreover, as AI technology advances and becomes more ubiquitous , it is incumbent on every solar asset owner to answer the question of how this technology will disrupt the industry. 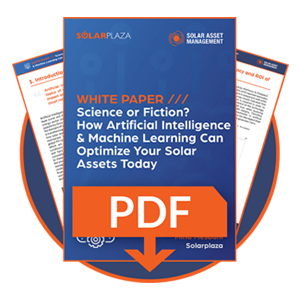 This white paper explores the areas, which can be and are being enhanced by AI, utilizing case studies to capture the current potential of artificial intelligence to drive efficiency and Return On Investment (ROI) in solar portfolios. Furthermore, we shine light on the facets of asset management that can be automated, to help you navigate through the great amount of noise surrounding the topic. Additionally, different Machine Learning (ML) techniques, which have been or can be deployed in the overall operations and management of solar assets, are examined to provide a working understanding of this complex technology.